Our next suggestion is a truly rare and exclusive experience: diving into the depths of the Azores, up to a thousand metres deep. And visiting, for example, the crater of a dormant volcano or the wreckage of the U-581 German submarine, sunk during World War II. This is possible because the only scientific research manned submersible operating in Portugal is based in the Azores, in Faial island. 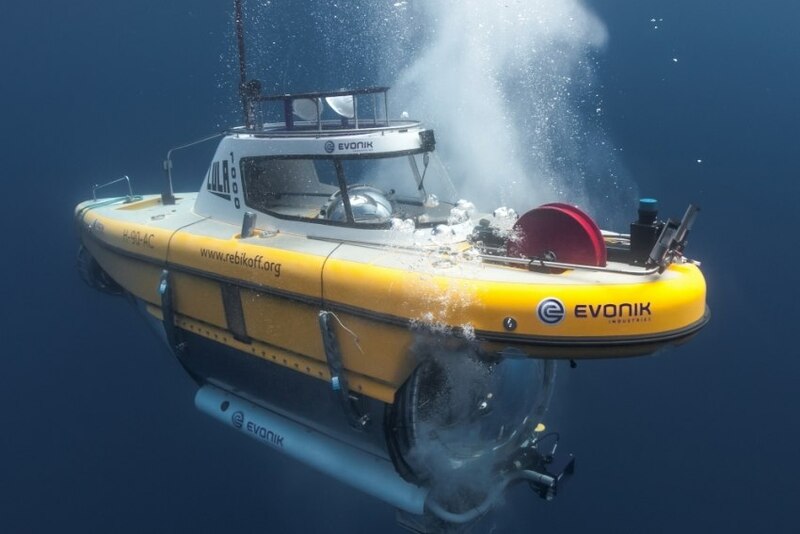 LULA1000, this submersible's name, belongs to the Rebikoff Foundation, and was launched in 2013 to support different scientific research projects by collecting images and data. It is one of only ten that in the whole world have the capacity to descend to the thousand metres of depth or more. When not involved in scientific missions, LULA1000 can be rented to carry one or two passengers to these depths in the middle of the Atlantic. On the program you can visit the sleeping volcano of Mont'Ana, four miles off Horta. Encounters with conger eels, squid, wreckfish, monkfishes, sixgill sharks (deep sea sharks) and other species are frequent. Part of this volcano is covered by a yellow cold water coral reef, discovered in 2013 by the LULA1000 team. A different program includes diving a thousand metres, close to Pico or São Jorge islands. The dive starts on the slope of one of the islands where, due to the relief, you can observe a concentration of underwater life, such as deep‑sea pelagic species, squid, dragon fish, viper fish among other deepsea fish, ctenophoras, jellyfish and other invertebrates.You can often see sharks on the slopes colonised by deep water corals and fields of sponges. Finally, the one that is probably the most fascinating of the three programs, especially if you are interested in this piece of history: diving 870 metres to the wreck of the German U-581 submarine, sunk during World War II, February 2nd, 1942, off Pico island. The shipwreck was located by the LULA1000 crew in September of 2016. Today the U-581 submarine is a genuine artificial cold water reef, colonised by various species of deep water corals and sponges and countless other fish and crustaceans. The shipwreck is in a good state of conservation, and you can perfectly make out the hull, conning tower, propeller shaft and the deformations caused by the detonation of the depth charges that caused it to sink. The ascent is made along the slope of the island of Pico which is covered by a garden of cold water corals. Any of these adventures is only available, as previously mentioned, for one or two people in each trip. In addition, exclusivity is paid: from 3,000 to 7,000 euros, depending on the program and the number of passengers. Still, this is an opportunity to see one of the least explored areas of the planet, the deep ocean. This submersible was built by the Rebikoff-Niggeler Foundation (FRN) to be used in high-quality underwater filming. LULA1000 is essentially a deep dive chamber with propulsion, carrying the camera operator and pilot seated inside the wide-angle lens. The large observation porthole, made of 140 mm thick acrylic, makes it an excellent tool of observation and documentation. A series of strategically placed spotlights illuminate the area in front of the observation port. LULA1000 and its team have already participated in numerous missions in the Azores, including filming for documentaries such as "Mountains of the Deep", in the BBC "Atlantic" series (2016), and "Ocean -Blue Planet", also by BBC and still in production phase. The Rebikoff-Niggeler Foundation was established in 1994 and is a non-profit organisation. It operates in film production on deep sea fauna and habitats, and research (biology, geology, oceanography, archeology, etc.) business. It inspires and honours the life and work of two figures, Ada and Dimitri Rebikoff-Niggeler, a Franco-Swiss couple who, between 1948 and 1991, dedicated themselves to the invention and development of technological and research equipment in the underwater world. To know more about the Foundation, go to www.fundoceano.com.